By default KnowAll disables the posts functionality of WordPress. You can re-enable this by following the directions below. Once you’ve done this, you will be able to change the front page displayed from WP Admin > Settings > Reading > Front Page Displays. Ensure you have some posts to display, these can now be created from the new Posts > Add New menu. Create a dummy page from Pages > Add New. Name it ‘Blog’ or whatever you wish the blog archive to be titled. You do not need to anything other than name and publish the page. Assign this Blog page as the posts archive from Settings > Reading > Posts Page. Set as your newly created Blog page. (see screenshot below). Assign the Homepage as Knowledge Base Archive to ensure that the front page of your KnowAll site remains the knowledge base. You’ll need to add the Blog page to a navigation menu or otherwise make it reachable. This can be done from Appearance > Menus. 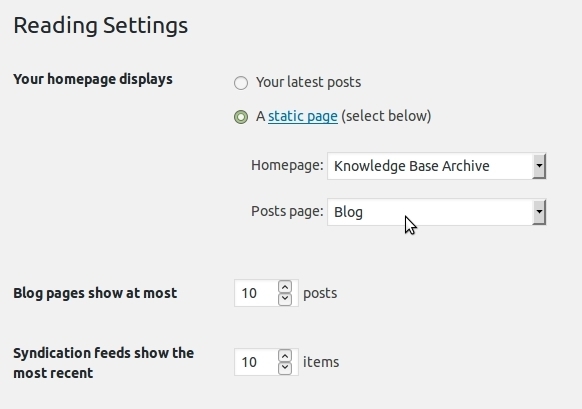 Your Blog page should now function as a simple posts archive.